We Have Enough Bad News. It's Time To Channel Kindness. We are not naïve, we know that our country is facing crises on many levels, but we also know that in order to stand together to overcome these obstacles we must not only believe but prove that the good outweighs the bad, that our strength outweighs our weakness, and that love outweighs hate. The Emotion Revolution was launched on the basic belief - supported by a growing body of scientific research - that emotions are fundamental to a young person's decision making, academic achievement, and overall well-being. While national, big-name groups can have a tremendous reach, organizations that provide programming and resources on the ground -- no matter how small -- are a vital component of the nonprofit ecosystem. Traditional mental-health delivery methods that we think are appropriate, like telephone hotlines and self-help books, may not actually be useful or effective for young people. Born This Way Foundation is committed to listening to young people themselves and connecting them with the resources they prefer to use. Typically, telephone hotlines have been promoted as a vital resource for youth who need to reach mental-health professionals. However, more young people than ever are using text messages and digital outlets to communicate. Shouldn't we meet them halfway? For too many years, we've been afraid to talk about mental health. Too many of us suffer in silence, or fail to help people close to us, because we worry about what others will think. Listen. That's probably the most important thing you can do for any person who is sharing their story with you. Simply being present and giving them your undivided attention is huge. Many youth experience events in their early life, through no choice of their own, which can be deeply stressful to a developing mind and brain -- both highly sensitive to beneficial and detrimental influences. 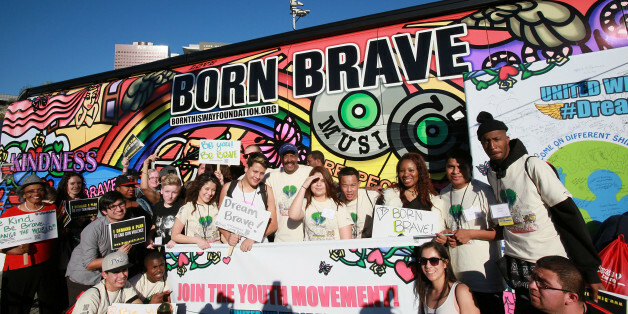 The Born This Way Foundation is opening doors for many youth to have the full life they are born to live. On Sunday, I ran the New York City Marathon. You can file that under things I never thought that I would do, but here I am, icing my knees with frozen broccoli stir fry and hobbling down stairs. While our runners have been stretching, training, and psyching themselves up for this enormous challenge, the team at Born This Way Foundation has been inspired to think more critically about the intersections of mental and physical health. As many members of the LGBT community celebrated National Coming Out Day this month, it is important for us to take a moment to remember that not everyone who comes out has the luxury of receiving a safe, let alone accepting, reaction. For reasons greater than myself, I decided to dedicate my time to train for the NYC marathon and drastically altered my lifestyle to accomplish this immense personal feat. With the support of my wife and my two beautiful sons, I thought to myself, "There is no better time then now to challenge myself and do this." When you act from a place of kindness, you act from a place of confidence and I believe when you stand up for what you believe in, when you act from a place of love and kindness, those teachers, those mean girls, those negative role models will just fall to the wayside. Whenever you attach a voice as powerful as Lady Gaga or One Direction to a cause, you immediately have the attention of their entire fan base, thereby generating momentum and having it shared with and by others, shifting behavior in a positive way. We believe there is a need for a new narrative, a new strategy, and new tools to construct more inviting and welcoming pathways into mental health treatment. The millenials and younger generation will drive badly needed "new rules" on de-stigmatizing mental illness. I came into the weekend with an open mind and few expectations. I left with a broader understanding of what it is to work on a team. In this interview, Oprah muses in her own words, with immediate reactions from the afternoon. She talks Gaga, bullying, education, inspiration, Harvard, and even ends up with a surprise gift underneath her chair. On a personal level, the event made me want to change. It made me want to do more for others because I realized how powerful a simple compliment can be. I was lucky enough to be asked to write about this event, and it makes me sad that you all couldn't be there.